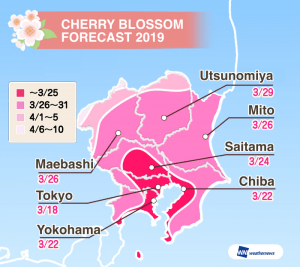 The cherry blossom season will begin on March 18 in Tokyo – Weathernews Inc.
Weathernews Inc. (Head Office: Mihama-ku, Chiba-shi; CEO: Chihito Kusabiraki) has announced the Cherry Blossom Forecast for the upcoming cherry blossom season. This season's blossoming of Yoshino cherry trees is expected to begin in Japan's major cities one after the other, first in Tokyo (Yasukuni Shrine) on March 18th, followed closely by Kochi (Kochi Park) on the 19th, and Fukuoka (Maizuru Park) on the 20th. The blossoming period is expected to be in line with the average year or slightly earlier in Eastern and Western Japan, and at the usual times in Northern Japan. Nationally, it looks as though the blossoms will be slightly later than last year, when they appeared earlier than usual. In addition, although cherry trees bloomed out of season last October due to a loss of leaves caused by wind and salt damage from a series of tropical cyclones affecting Japan in September, it is thought that the impact on this spring's cherry blossoms will be minimal. *The "yearly average" blossoming periods used in this press release are calculated based on the average dates during the past 5 years, from 2014 to 2018. 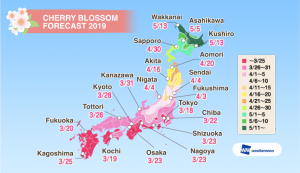 Western and Eastern Japan: February and March temperatures have been slightly above average, so the development of cherry blossom buds should progress normally. As warm days increase from the middle of March, the blossoming time will approach quickly, and it looks as though blossoms will appear in line with average year or slightly earlier in many places. In Tokyo's Ueno Park, blossoms are expected starting from March 20th, reaching full bloom on March 28th. Arashiyama in Kyoto will likely see blossoms beginning on March 28th, and will enjoy cherry trees in full bloom in early April. Northern Japan: Due to the effects of frequent low pressure systems and cold fronts, temperatures in February and March will be normal or slightly lower, so it looks like there will be periods during which bud development will be temporarily hampered. However, with temperatures rising in April, development will progress, so the forecast is for blossoms to appear in line with yearly averages. In Hokkaido's Goryokaku Park, blossoming is expected to begin on April 27th, reaching full bloom during the first part of Golden Week. In the Kanto region, although there will be days of low temperatures due low pressure systems and cold fronts until early March, temperatures are expected to rise gradually after the arrival of the first south wind of spring in mid-March, helping the buds to develop. Since temperatures in February and March will be slightly higher than normal, we expect cherry blossoms to appear in line with averages or somewhat earlier. It looks as though cherry trees will bloom at the same time as, or slightly later than, last year, when the blossoms appeared earlier than usual. Blossoms are expected appear at Tokyo's Yasukuni Shrine on March 18th, and will arrive in stages throughout Tokyo in late March. By the end of the month we expect the blossoms to have spread from the southern part of Kanto to the northern areas. 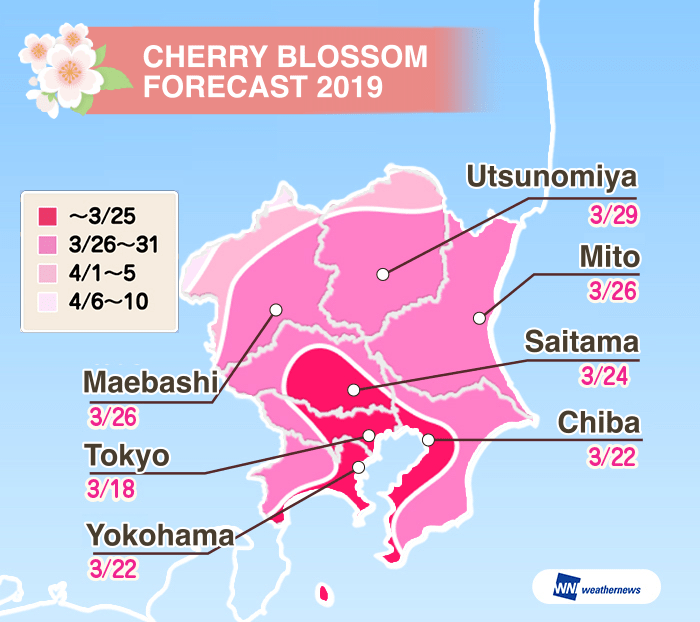 We predict that cherry blossoms will be in full bloom in the southern part of Kanto at the end of March, and at the beginning of April in the north. In the Kinki region, although there will be some days of low temperatures due low pressure systems and cold fronts up until March, temperatures are expected to rise gradually after the arrival of the first south wind of spring in mid-March, helping the buds to develop. Because of this, we expect that cherry blossoms will start to bloom at the usual time in late March, which is the same or slightly later than last year, when they arrived early. We expect that blossoms will start to appear around March 23rd in Osaka Castle Park, and be in full bloom at the end of the month. Many of Kyoto's cherry blossom viewing spots will be at their best near the beginning of April. The number of sunny days will gradually increase during April, so at many of the famous viewing spots it should be possible to enjoy cherry blossoms in full bloom under blue skies. * For Hokkaido, varieties other than the Yoshino cherry tree, such as Ezo Yamazakura and Chishimazakura (Kurile Cherry) are included. Since 2004, Weathernews has run the annual Sakura Project, in which members referred to as Weather Reporters watch cherry blossoms and observe their progress from the "bud" stage through "start of blossoming," "full bloom," "blizzard of falling petals," to "cherry trees in leaf (blossoms have fallen)." The number of participants reached 10,000 in 2018, and over the last 15 years we have accumulated more that 2 million Cherry Blossom Reports. 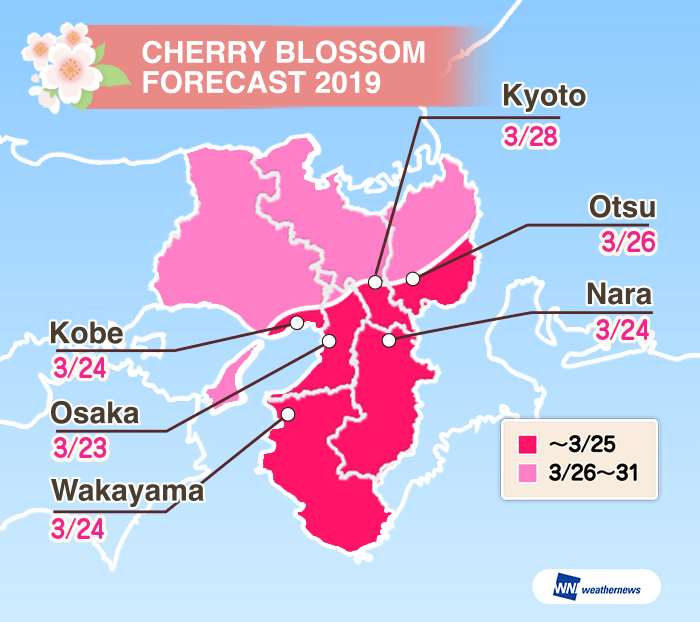 Incorporating the reports we receive from all around Japan on the state of bud development enables the Cherry Blossom Forecast to provide tree-by-tree pinpoint predictions. 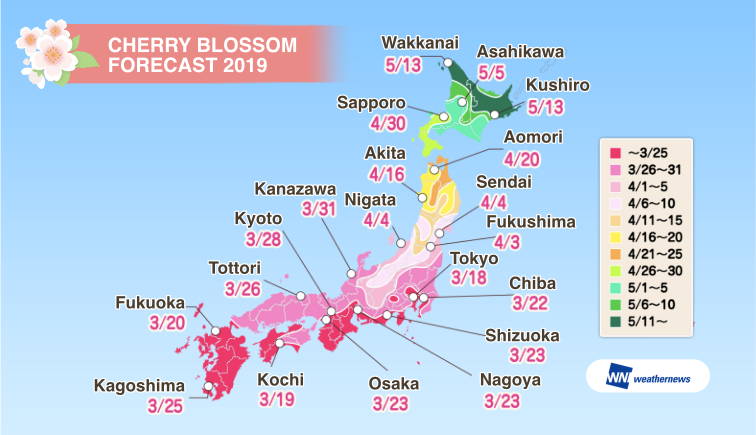 In addition to these cherry blossom reports, Weathernews estimates blossoming dates based on telephone interviews with people at each location, as well as temperature observation data and temperature forecasts. At Weathernews, we define the first day when at least one flower is in bloom on the tree as the "blossoming date". Also, the blossoming date for parks, etc. with multiple cherry trees on the premises is defined as the "peak day of blossoming (1 blossom) for that site." In order to reflect the trend in recent years for cherry trees to begin blossoming earlier, the average year's blossoming dates are calculated based on the averages during the past 5 years, from 2014 to 2018. In addition, the average year's blossoming dates are described as "in line with the average year" when they fall within 2 days of the average, "slightly early" or "slightly late" when they are 3 to 4 days before or after the average date, and "early" or "late" when blossoming occurs 5 days or more off the yearly average. We define the day when 80% or more of the flowers are in bloom as the start of "full bloom".